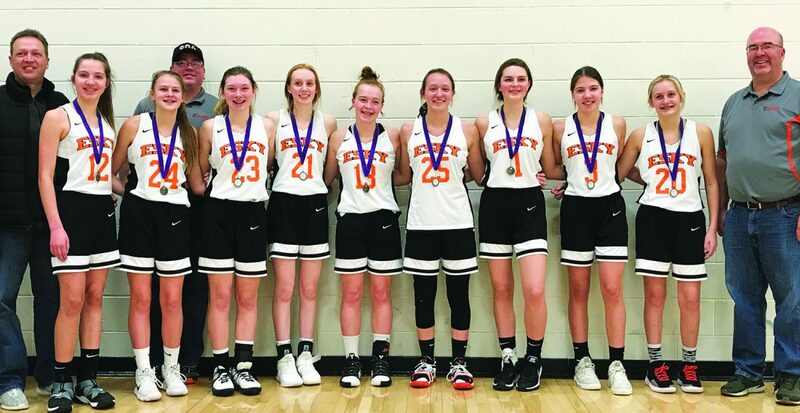 Courtesy photo Pictured from left: coach Todd Maki, Keira Maki, Nora Moberg, coach Josh Mott, McKayla Mott, Mari Bink, Carney Salo, Maddie Chaillier, Katelyn Stalboerger, Morgan Maki, Saylor Henderson and coach Todd Salo. The Esky 8th grade girls travel basketball team had a successful season. They began with a second place finish in Neenah, Wis. in November, a first place finish in Oshkosh, Wis. in December, a first place finish in DePere, Wis. in January and a first place finish in Marinette, Wis. Jan. 27.